I was really looking forward to bulb forcing this winter. I had read Bulb Forcing by Art Wolk, my new bulb-forcing bible (review here), and was inspired to broaden my selection of bulbs to force, plus I had a gift certificate from Brent and Becky’s Bulbs that made broadening my selection painless. So far, however, the results have been disappointing. I had ordered ‘Winter Sun,’ a variety of paperwhite narcissus reputed to be “fragrant, fast to bloom, a speedy bloomer and very easy to grow”–that’s straight from the catalog copy. I was looking for a paperwhite that had a fragrance similar to the poet’s narcissus (Narcissus poeticus) our family treasures each spring. I had read that ‘Winter Sun’ had a milder fragrance than the typical paperwhite, and I thought that was a good place to start. The bulbs arrived in October and I potted them up right away, hoping for blooms by Thanksgiving. I did get a few blooms, but most of them were blasted, and the plants didn’t seem as floriferous as I had been expecting. I was so disappointed I didn’t take any pictures, which I now regret, because I want to show you what blasted buds look like. 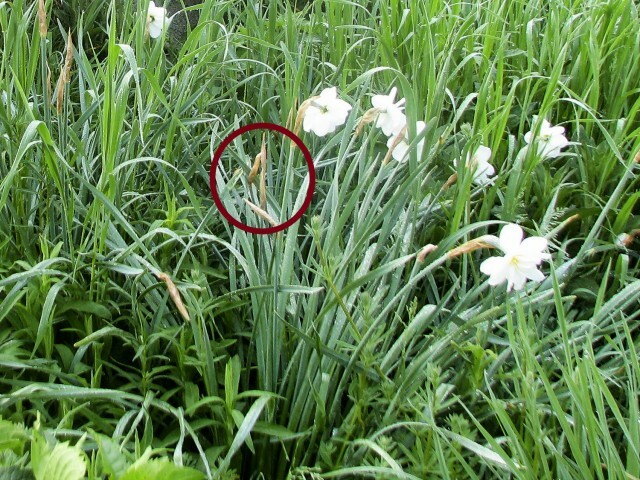 Double poet’s narcissus often has this problem, and I found an old photo that has some blasted buds in it. The buds look brown and papery and they will never open. I had glossed over the numerous times Art Wolk emphasized how he learned by trial-and-error. Somehow I thought since I was learning from his errors, I would have none of my own. Ha! Mr. Wolk says that bud blast is caused by one of three things: improper chilling time, improper chilling temperature, or inadequate watering when the flower bud is beginning to expand. You’re not supposed to have to chill paperwhites, so that eliminates the first two problems and leaves us with inadequate watering. 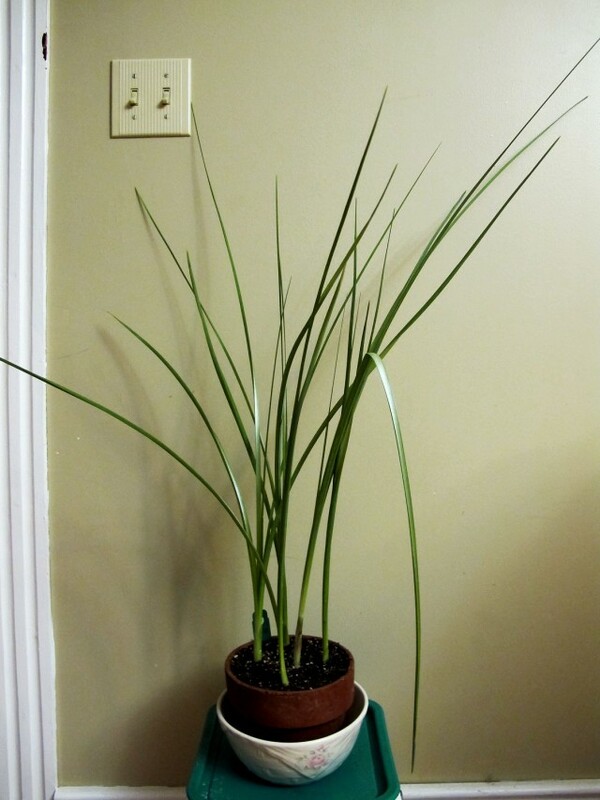 I had used a self-watering container that was long and narrow (picture here) so I could easily keep it on a window sill. The reservoir indicated it was full, but perhaps the roots hadn’t traveled that far? I had used this container to force bulbs before with reasonable success, so I wasn’t expecting problems. If you want to see well-grown ‘Winter Sun,’ go visit A Garden For The House. You will notice Kevin Lee Jacobs describes them as easy, too. Sigh. The foliage is almost three feet long, but not a sign of flowers. Well, why? It could be that the bulbs weren’t flowering size. I am not that familiar with Dutch iris, but my past experience with Brent and Becky’s tells me they would not send inferior bulbs. Since Wolk only discusses reticulated irises, not Dutch irises, there’s no specific advice from him to guide me. But he does discuss what goes on inside a bulb when it’s chilled (technically called vernalization). One thing that happens is chemical changes take place that enable the flower stalk to elongate when it’s time to bloom. So those irises may have flowers that are stuck inside the bulb because the stem wasn’t chilled long enough. And it wasn’t chilled long enough because I saw it sprouting. And it was sprouting because my carefully chosen spot was still too warm to persuade those bulbs that it was winter. Wolk says 48°F is the ideal temperature for vernalization. I have a sensor at my carefully chosen basement spot and it’s a bit warmer–on average 51° I’d say. For a plant that thinks -10°F to 0°F is the coldest winter will ever get, 51° probably feels like it’s safe to come out now. I really don’t know why. It was an experiment I conducted because I thought I had nothing to lose–the bulbs wouldn’t survive outdoors anyway–but if I ever mistakenly order Dutch iris again, I think I’ll take my chances planting them in the great outdoors, in the warmest microclimate I can find. Part of the fun of gardening is trying new things, but it’s always more fun when the new things work out. I just started forcing the hyacinths I put in the refrigerator October 17th. Good thing I wrote that on the tag, because I thought I had marked the date on my calendar when I could start taking them out, but that would have been December 25- January 2 (10 – 11 weeks). I could have started them two weeks earlier if I had checked the tag instead of the calendar. Hopefully I will have better luck forcing these hyacinths. I bought a little pot of primroses to hold me over until the hyacinths bloom. It cost less than a gourmet chocolate bar and will cheer me up longer. And I have had good luck planting these sweethearts outside in the spring. For that reason I always pick a color I want to have in the garden. Did I mention I’m a sucker for pale yellow? Well you can’t know until you try and I give you an A for effort! I am just happy that my Amarylis Evergreen survived last year in my cellar in an unheated house in what was one of the coldest winters on record – this year I brought her with me to Florida and guess what? She’s sending up a big bud! Yay! It’s the small little victories and I’m predicting you will have many more victories than things gone wrong. Kathy — I have not had good luck with any double flower Narcissus bulbs in the garden. 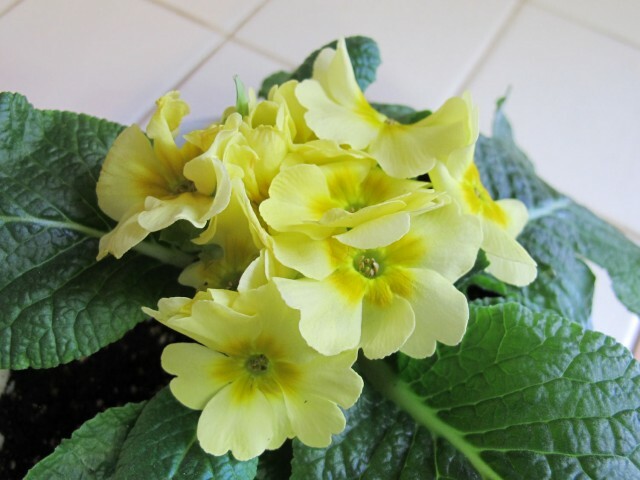 And I just bought myself 3 little pots of yellow and white primroses to keep me going. Warmer and less snow than usual but still winter here in Wisconsin. I bought the book (I believe because you reviewed it), I really enjoyed it. 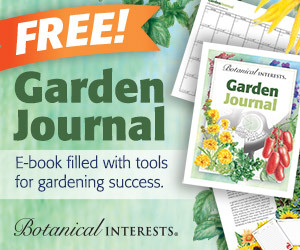 I had already potted up numerous pots of tulips, grape hyacinths and crocus before I received the book. Unfortunately with the very warm fall, even though the pots are in my garage, it was very warm and they started to sprout much earlier than anticipated or wanted, but I have left them alone in the now cold garage. Hopefully when I take them out when I want them to bloom they will accommodate me. I have thought of putting snow on top of them like the book suggests, to slow down progress. I also potted up urn inserts with hellebores, heucheras, and tiarella, so I can pop them into my urns come the end of March/April, but again the warm fall has encouraged my hellebores to bloom already. Ugh, the best laid plans. I wonder if there is some way you can enjoy the hellebores now? Maybe repot them into something else? And then replace the hellebores that were in the urn inserts with something else in the spring? I have been trying to enjoy the Hellebores in the garage, in their cold storage. I’m afraid to bring them into the house because that will be too warm, from past experience the Hellebores do not like my house. Perhaps I will just cut a stem to enjoy inside. Yes, cut one or more stems. They last a long time in a vase. My ‘Thanksgiving Bloom’ hellebore growing outside starting blooming during the warm period. Twice I’ve been able to cut a flower right before a cold snap/snowfall and enjoy it in a vase. It would have been turned to mush outside. I agree the plant itself wouldn’t do well indoors. Been there, tried that. It’s good to see I’m not the only one who suffers trials and errors. Keep the faith! I have had similar bulb forcing failures. Sorry about yours not growing well, but I do feel less alone. I enjoying reading this post because it made me feel less alone in my bulb-forcing failures! I too was tempted by Art Wolk’s book to try again this year, but this time outside, using his inexpensive cold frame idea (a pair of plastic basement window well covers from the home improvement store, plus leaf mulch) and 50 white tulips, divided among 8 terra cotta pots. They’re chilling now, and since they need such a long chill time and our winter has been so mild in the Northeast, I’m not even going to think about them until March… Fingers crossed! I was hoping my failures would encourage others, as well as the idea to get a Plan B primrose from the grocery store. Good luck forcing those tulips! I don’t have much luck even growing them in the ground, between the voles and my clay soil. I’m sorry, but I thought this post was very entertaining. I shouldn’t say that, but it reminds me of all the errors I’m supposed to be learning through as well! There may still be hope for the iris, I think they bloom later than tulips so maybe in a few more weeks? I’ve had a few double daffs which blasted nearly every year. they’ve since moved on since there are other double types which are not as susceptible. I always felt warm, dry air was the culprit but it’s just a guess. No need to apologize! I always find your posts entertaining! And I did hope to make lemons out of lemonade. Beth, I think your criticisms of Wolk’s book are fair. It is not a quick read-through kind of book. I read each chapter through in one sitting and I wish now I had underlined all the important bits of trivia. The jokes don’t appeal to my sense of humor, either. Even so, there is more information in that one book than you can find anywhere else. Gorgeous yellow primrose. 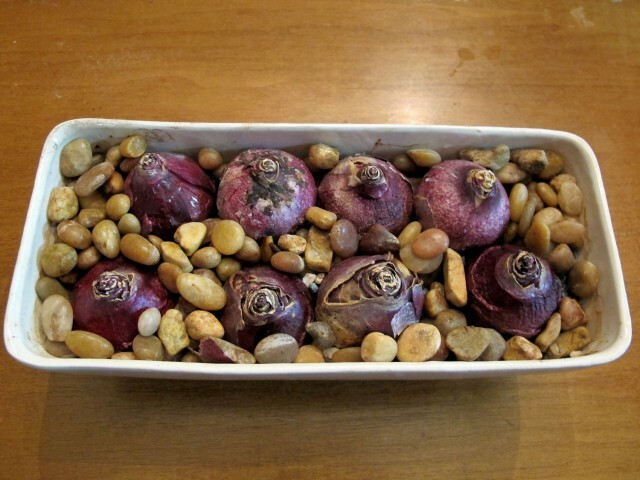 I really have poor luck with forcing many bulbs so this is helpful Kathy. I still try even with the failures. Donna, you really need to get Art Wolk’s book. It explains so much! Thank you for the tip, Sharon. I won’t give up yet! I’ve had trouble with bud blast here, too – very frustrating! You have my sympathy. Is it possible your bulbs were exposed to the gases of apples, bananas, or avocados which cause them to not develop flowers? Rachelle, that is a very good question, but no, I don’t believe they were. How much exposure would be too much? The box containing the bulbs was in the kitchen, but certainly not in close proximity to any of those fruits. Is being in the same room too much exposure? I would think being on the same table or in the same drawer of the refrigerator would be a problem, but just passing through? I have found that scent is not a consistent thing. I can’t explain it yet, but I find that it is just not the same from year to year. I am having the same issue – only the Christmas cactus is blooming. The African violet, the kalanchoe and the amaryllis are green but not flowers this year. Last year at this time they were all in full bloom. Not sure what I did differently. I’d rather plant and have a chance, than not plant and have no chance. Love the primrose. I think I’ll look for some at the grocery store today. 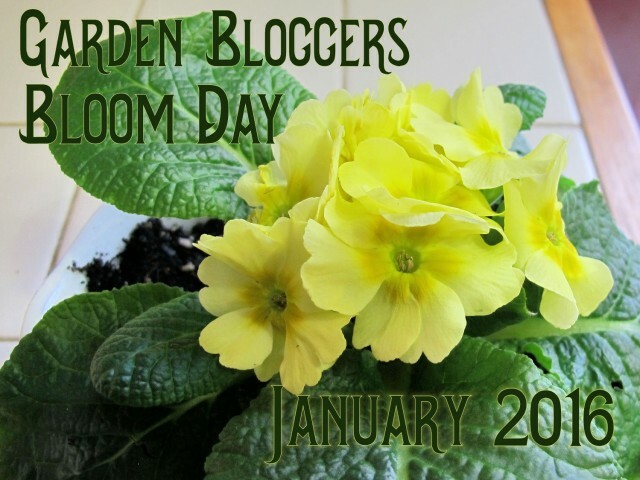 Thanks for joining in for bloom day!